2 weeks of ownership, very impressed with the bike. Looking forward to learning and sharing info with all of you. While I am at it, I just came across this forum. I had been checking on the other forum (same exact name), what is the difference, how come two forums? Hey Fernando! Welcome to the forum and congrats on the new ride. 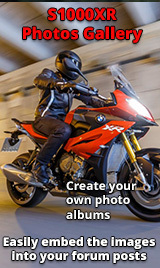 Both forums share the same interest in the bike and you'll find that many owners are members of both sites. I've found this site a bit easier to navigate than the other but folks on both are interested in the same things pertaining to the bike. I presume you get to ride all year in CA ? Hope you enjoy the bike. Hi everybody, sorry, it has been a while. I have been busy reading and learning about my bike, riding, etc. Thanks for the warm welcome and yes, we have no no-riding season here.